Paper Crafts by Candace: Feeling Fruity - Stamp Release Week! Hey Everyone! Happy monday! Sooo excited to share with you what I created with the new stamp set Feeling Fruity from Jaded Blossom!! For a complete look at the new stamp set coming out on Friday click here to go to Jaded Blossom! Here is my project.. a Pocket card! Everything was cut from the Silhouette Store. And of course Thanks a Melon is from the new Feeling Fruity stamp set. Make sure to check out Jaded Blossom to see what the rest of the DT did with this stamp set! tooo cute chickie! 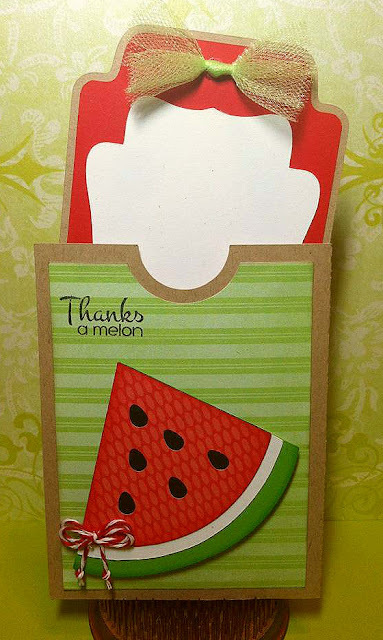 love the watermelon..... need to try one of these pocket cards! I love this watermelon!! Its super cute! Love your pocket card Candace! nice cut with the melon! Never made a pocket card before. Perfect sentiment with the watermelon and I like the twine as an added detail.